I haven’t been feeling the best lately and I believe it’s been because of being lax with my food. I have been disregarding my egg allergy and eat dairy & beef on occasion when I really have a craving. So, it’s time to get back on track. Or, at least the best I can considering I have a trip to PA coming up and it’s so hard to find things to eat in restaurants or substitutes in the local stores. I think my breakfasts will have to consist of the vegan protein powder I’ve been using for the past year. Anyway, a few weeks ago, I was with a group in Olympia and my mom-in-law and I ate at a restaurant called Darby’s. I was delighted to see so many choices on the menu that were vegan (the owner, it turns out, can’t eat eggs). 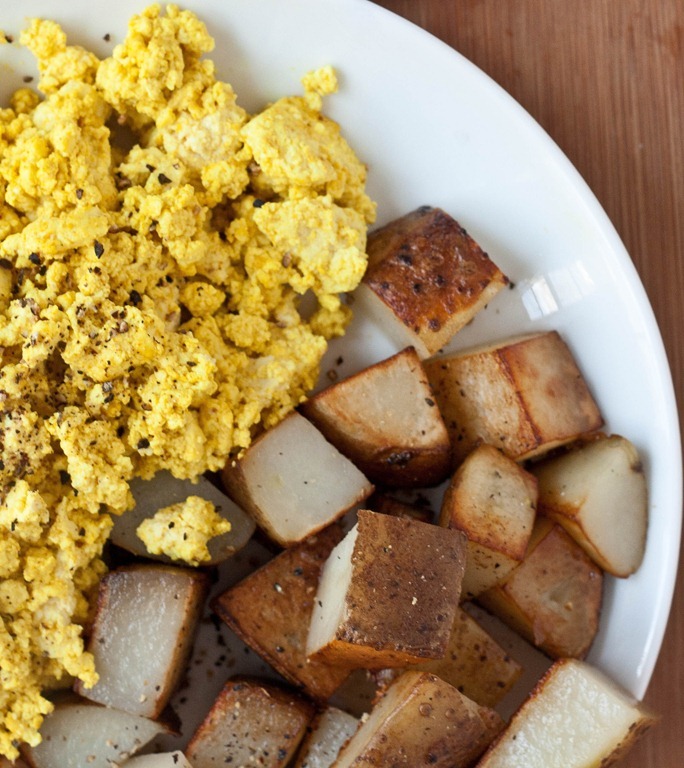 Her faux scrambled eggs were really good…almost like eating the real thing. She wouldn’t divulge her secret recipe, so I started scanning the various ones online. All seemed to have three common ingredients: tofu, nutritional yeast, and tumeric. Using those base ingredients and a few others, the following recipe is what I came up with. It tasted very good and even my husband really liked them (he’s also developed an egg and dairy allergy). I think in the future, however, I’m going to add some chives and peppers to give it even more flavor. Put all ingredients in a bowl. Use a potato masher to break up the tofu and mix in the ingredients (you could also use a food processor, if you prefer). Spray a pan with non-stick olive oil. Cook mixture on medium to low heat, flipping over sections as it browns. It will only take a short time, so keep an eye on it or it will really stick to the pan. I made this again and it’s so much better with the red bell pepper and chives!